Click image to enlarge and read! Dr. E.J. VanGieson bought the property, which is now High Point Country Club, and moved to Montague around 1949. He had been the doctor for Bloomfield Fire Department and best friends with Bloomfield's Chief Houck. "Doc," as we called him, wanted to start a volunteer company in Montague and offered one acre of his land if ten volunteers could be found. Each volunteer was asked for $100 to join, which was a hefty sum - the first twelve men were truly committed. The other founding members were John Ardler, Lloyd Coss, Eston Myers, Donald Cole, Theodore Brace, Robert L. Westbrook, Joseph Zitone and Irving Aber. Myers and Zitone headed up the building committee and drew up the plans. Dayton Westbrook donated the hemlock trees for the firehouse frame work. 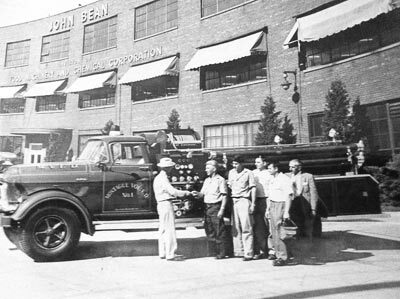 Carpenter hauled the trees from the woods to Robert Westbrook's saw mill where he and Lorenzo Crawn sawed it into framing lumber then trucked it to the site. A well was dug by hand. O'Niel leveled the ground and trucked in the fill. Everyone worked weekends to complete the building. 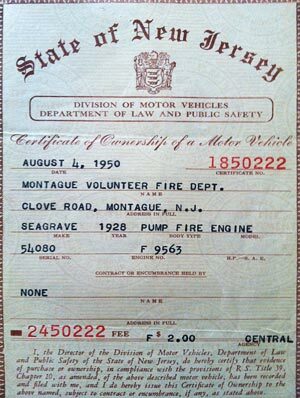 The first piece of equipment was then purchased—a 1928 Seagraves 750-gallon pumper from the Bloomfield Fire Department. We paid $100 for it. Chief Houck outfitted it with hoses and equipment and members from his department taught us how to run the truck and also gave us some fire fighting lessons. The town of Caldwell, NJ donated an air raid siren—with one hitch—it was atop of a 75 -foot tower. O'Niel, Carpenter and Ham Casterlin retrieved it—fortunately without incident. Raising money was particularly difficult; it even took two or three years to convince the town council to help us—finally we received $200 a year. 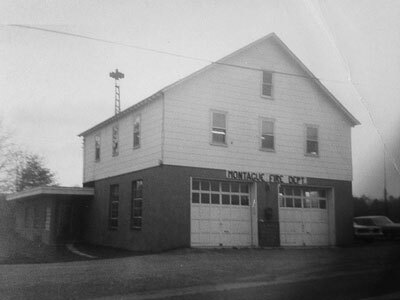 We had clambakes, trap shoots and canvassed the town for donations; during which time we knew the township was paying Port Jervis almost $1200 for fire fighting help. 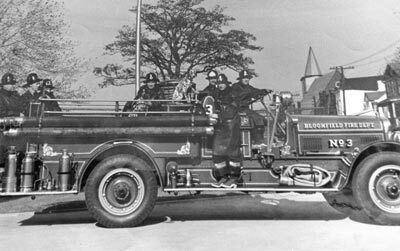 In 1952 or '53 it was Bloomfield again who came through—at their auction we bought a 1923 American LaFrance 1000-gallon pumper with a lot of equipment—purchase price, $300. We were in business with two trucks, but a risky business it was. 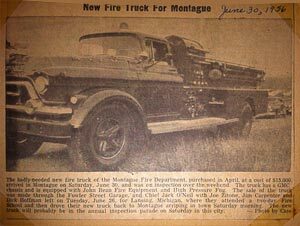 Montague Township with its high crown roads posed a problem for the high wheels and tires of the trucks, with no duals on the back. 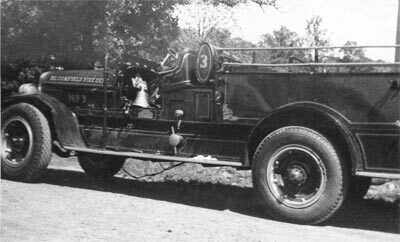 Ed Zitone had first-hand experience with this dilemma as the 1923 LaFrance got away from him and turned over by Harold Everitt's house on the S-turn. The pumps were also difficult to start; only a few of the guys could crank them. Fortunately, there were not many house fires back then, more brush and woods fires. We did have plenty of house work pumping out cellars during the 1955 flood, though. So there was the simple beginning of this integral part of the community. It began with committed men and continues today with the same.